If you’re into rock music then you’ve got to check out the Solid Rock Cafe located in Glasgow. 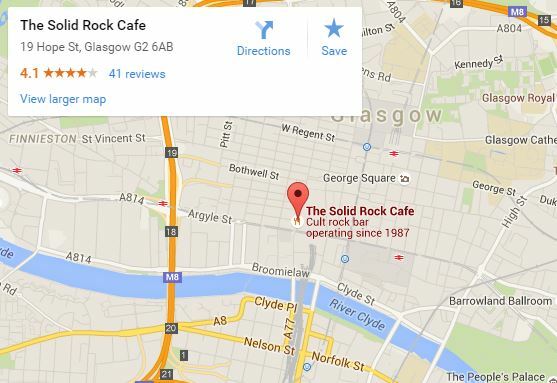 The Solid Rock Cafe is Scotland’s number 1 Rock Bar since 1987! You’re guaranteed a rocking atmosphere, your favourite tunes and a brilliant choice in menu. Food is served from 12pm – 9pm daily with dishes including your lunch time favourite sandwiches, hot dishes such as pizza, burgers and much more. The specials menu is updated on a regular basis so make sure you check it out! Solid Rock play rock music from all across the ages, but they are always happy to take a request. It might not be your average biker cafe but you’re in for the time of your life at Solid Rock. There’s not a large car park for the cafe but there’s enough space outside for bikers to meet, and the cafe is located close to lots of train stations.